My name is off the 10 Most Wanted List at last, but it still echoes through the aisles of supermarkets and department stores whenever young girls stray from their mothers’ sides. Not all of the girls are so young anymore, because it has been more than a quarter-century since a soap opera elevated my name from antebellum cinematic obscurity. Scarlett O’Hara: "I never really loved Ashley." Rhett Butler: "You certainly gave a good imitation of it." 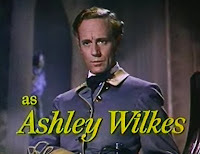 That Ashley, Ashley Wilkes, is the wimp who gets his girl stolen by rakish Rhett and then returns from the Civil War with post-traumatic stress disorder. Other than the fact that my great-grandfather returned from the same Civil War and named his son Ashley (who in turn named his son Ashley, who in turn named me Ashley), I am in no way related to Ashley Wilkes. Nevertheless, I was cursed by "Gone With the Wind" as a child, taunted by peers who gushed "Oh, Ashley, Ashley, I love you," mimicking the fickle Scarlett, who spouted that outrageous lie after confessing to Rhett the truth of her indifference. Except for that lingering annoyance, all the hubbub about Scarlett and Rhett and Ashley had pretty much died off by the time I was born. That year the most popular names for boys were, in order, James, Robert, John, Michael, David, William, Richard, Thomas, Charles and Gary. I grew up surrounded by those guys. Ashley was No. 904 on the popularity list for boys that year. In 1982, life changed for the very few of us named Ashley. A soap opera called "The Young and the Restless" introduced a character named Ashley A bbott. By the end of the year, for the first time in history, Ashley cracked the top 20 names for girls. Within a year it shot to the top five; a decade later it was the No. 1 choice in the land for little tykes swaddled in pink. For 11 years it clung to the first or second spot on the charts. Being an Ashley — of the male persuasion, anyway — has had its difficult moments as a result. In addition to a lot of funny looks, a whole generation of store clerks, medical receptionists and bank tellers have been subjected to the entire Ashley Abbott story when they raised doubt that a guy could be named Ashley. During the years when her life has changed mine, Ashley Abbott has played a name game of her own and been pregnant more times than the old lady who lived in a shoe. She has gone through Brian, Eric and Marc. She discovered her real dad was Brent, the tennis pro. Victor has been in and out of her life like a man being spit from a revolving door every 10 revolutions. Stephen rushed into her arms, then got murdered. Brad was replaced by Blade, who was run over by a train, and then Brad returned, only to be followed by Cole, Paul and the deviously mysterious Tom, whom she said she loved .. .. . but did she really? After 26 years, it’s all too confusing. I’m sure Scarlett could sort it all out but, to quote Rhett, "Frankly, my dear, I don’t give a damn." I am delighted, however, to report that Ashley is no longer is one of the 10 most popular girls names.